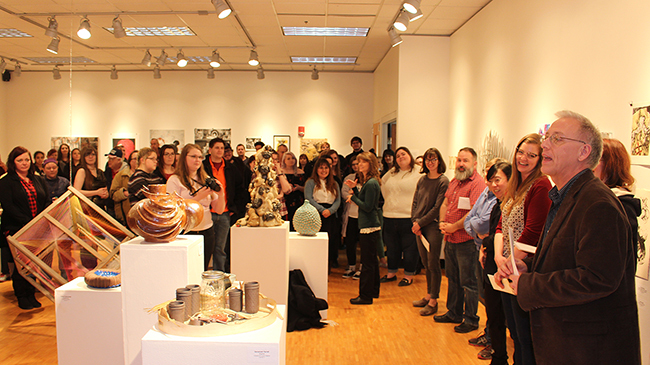 Full house: In a packed Ronald L. Barr Art Gallery, School of Arts and Letters Dean James Hesselman (far right) and Fine Arts faculty members gather to present awards for student artworks. Hesselman urged student artists to persevere, noting the power of art to start important conversations and change lives. (NEW ALBANY, Ind. )—Last week’s IU Southeast Fine Arts Juried Student Exhibition, a mainstay of the spring academic calendar, kicked off its run at the Ronald L. Barr Art Gallery with a festive and crowded reception and awards presentation. Over 65 works in media ranging from drawing and painting to ceramics and digital art were selected for the show by this year’s judge, Ms. Amethyst Beaver, assistant curator at the 21c Museum Hotel in Louisville, Ky. In praising the submissions for their “exceptionally high quality,” Beaver was impressed by the creative growth on display. “It was great to see many advanced students pushing themselves to refine and polish their craft, and to see others venturing outside of their chosen media to combine textile and performance, printmaking and installation, drawing and sculpture, among others,” Beaver said in her statement. Beaver identified common themes that seemed to course through the submissions and give the works a special personal power: body and body image, the exploration of self, personal and family history, and a critical engagement with the history and languages of art. Adara Fox is a case in point. Fox, a junior from New Albany, Ind., won the Fine Art Dean’s Award for her painting, “Rose Love,” portraying the skull of a lion set amid a mane of roses, a unique memento mori that serves as a remembrance of her late father. Fox works primarily in traditional areas of drawing and painting, but is increasingly intrigued by the possibilities of digital art. Savannah Goerres, from Jeffersonville, Ind., won the Executive Vice Chancellor’s Award for her performance piece, “Submerged.” In this work, Goerres sits in the corner, knitting a quilt that wraps her lower body and extends for some six feet out into the room, forming the tail of a mermaid. Blending nostalgia for childhood with traumatic memory, the blanket is both security and escape, yet as a living performance, it allows Goerres to interact with the public and for the public to interact with the artist while the work continues to evolve in real time, incorporating the experience of those interactions. For Beaver, such works rooted in personal experience end up resonating with people in a broader, more powerful way. The Fine Arts Juried Student Art Exhibition runs through Feb. 18 in the Ronald L. Barr Art Gallery, located in the Ogle Center. Homepage photo: Adara Fox, “Rose Love” (detail).